RSVP set includes card and envelope. Gorgeous Invites. Leaf paper is cotton rag, handmade, and dyed with real leaves. Each wrapper is a unique pattern. Portfolio Eco Invitation made from tree free, handmade and recycled papers for a Green Wedding. DIY portfolio invitation made from leaf impression handmade paper and recycled papers. Great for a Garden Wedding. The paper gets its patterns from real leaves, which are laid on the paper as it's drying. PAPER FACTS: Recycled cotton rag paper made by hand in India. 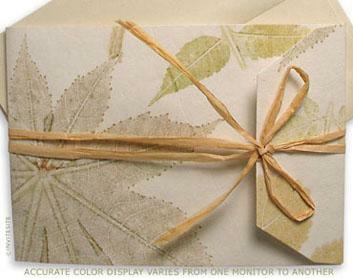 The invitation card and envelope are 100% postconsumer recycled paper made in USA or Canada. Colors: Green, off white, natural paper raffia and kraft photocorners. A modern and sophisticated portfolio invitation that opens to a wide landscape of 16" x 5". Invitation card and rsvp set are mounted inside, using kraft photo-corners. Portfolio:Die-cut and scored portfolio wrapper made from handmade leaf impression cotton rag cardstock from India. Printed with real leaves. Measures 16"x 5" open and folds to 5"x7". Mailing Envelope:Recycled 100% post consumer natural A7 envelope. Photocorners:8 kraft photocorners per invitation set. Ribbon:Two yards of natural paper raffia per invitation.